At Tetrosyl we have been manufacturing household fillers for over 40 years. Our Tetrion Brand has matured to become one of the most recognisable names within the professional trade market. Tetrosyl’s policy of continued development and improvement has fostered a reputation for developing exciting and innovative products for the Professional trade and the DIY markets. Our range of innovative high performance products include the well-known and first ever Original All-purpose Powder Filler and has since grown to offer a wide of repair fillers, adhesives and decorating sundries. The Tetrion range allows our customers to feel confident starting any large project or small repair job. 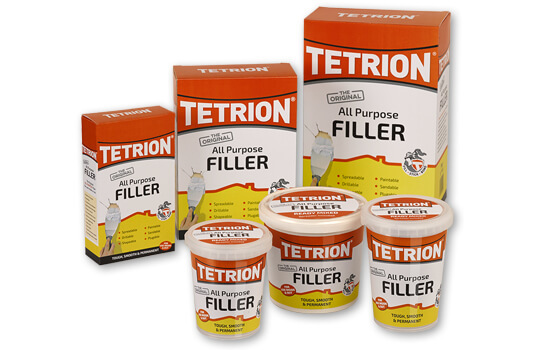 Our Tetrion All Purpose Filler is the same tried and trusted formulation which has been the go to for trade decorators and DIY enthusiasts for over 40 years. Tetrion All Purpose Filler is still the ideal choice for projects where a versatile, multi surface filler is required. Specially designed to give a super smooth, polymer re-enforced, permanent finish. Tetrion All Purpose Filler can be used for both indoor and outdoor applications. Available in a Powder, Ready Mixed and Tube format to suit any home improvement job. A super smooth multipurpose filler perfect for large and small jobs. Sets in minutes, creating an easy to sand, very tough and very smooth repair. 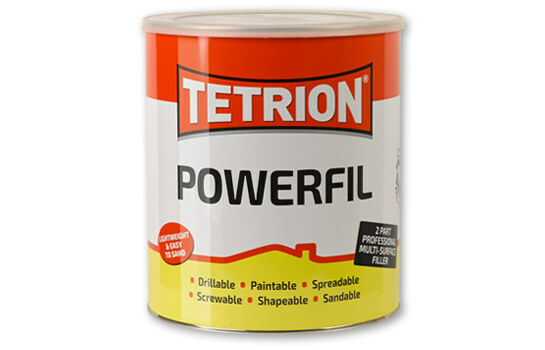 Ideal for a heavier duty approach our Tetrion 2 Part Powerfil is a fast-setting, waterproof filler which makes it perfect for outdoor use. Tetrion 2 Part Powerfil cures differently to our more traditional powder fillers allowing it fill deep gaps without the worry of uneven setting times. 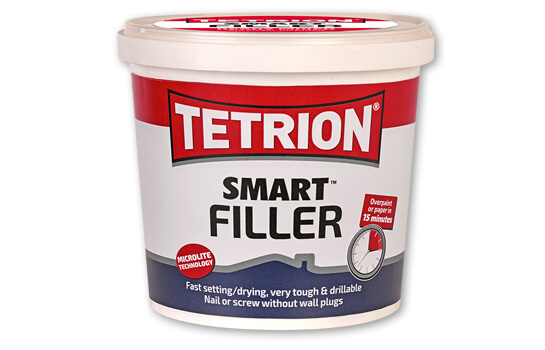 Tetrion Smart Filler has been developed as a lightweight smart filler with Microlite Technology and is the ideal filler for filling large holes or hairline cracks in one easy application. Smart Filler will not shrink, crack or slump and is super smooth with little or no sanding required. Sets 10 times stronger than ordinary lightweight fillers, meaning you can nail or screw straight into the filler with no need for wall plugs or drilling. The fast-drying formula can be over-painted or wallpapered in 15 minutes and is suitable for use on a wide variety of substrates. 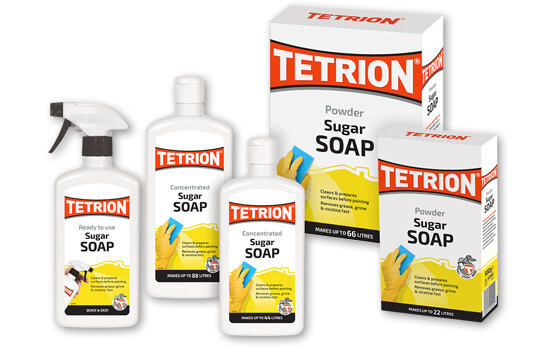 Tetrion Sugar soap is the professional decorator’s favourite surface cleaner. The answer for any job which requires cutting through grease, dirt, grime, wax and nicotine stains to achieve a clean surface. Preparing a surface with Tetrion Sugar soap provides an ideal foundation to achieve a perfect, trade-standard finish. Available as a powder, a concentrated liquid and as a ready to use spray; Tetrion Sugar Soap is the unsung hero, providing the crucial first step in turning a grimy wall or ceiling into a high quality DIY repair. Tetrion 4 in 1 is a new addition to the Tetrion Range. Based on new Inert Polymer Technology it brings a dash of modernity to Tetrion’s long trusted range of tried and DIY tested products. 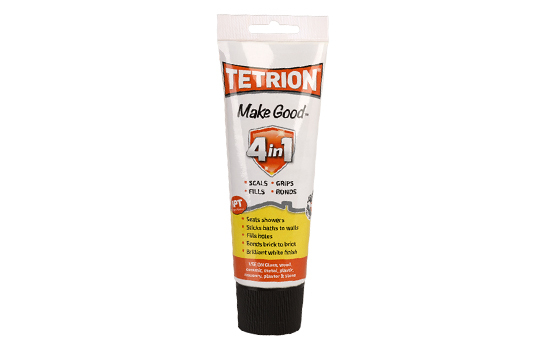 Tetrion 4 in 1 is a high performance, multi-purpose, professional quality sealant & adhesive. ONE product suitable for FOUR applications- Tetrion 4 in 1 is the ideal companion for the budding DIY enthusiast as it is more than capable of outperforming conventional products, specific to their use, such as silicone sealants, butyl/acrylic sealants and butyl/acrylic adhesives, as well as conventional fillers. Tetrion Super Fix is the quick and easy way to fill or reinforce small repairs where an ultra-strong, rock hard solution is required. Setting in just 7 seconds this product needs to be seen to be believed. The 2 part adhesive and powder format means filling or securing is a possibility for almost any non-vertical surface. 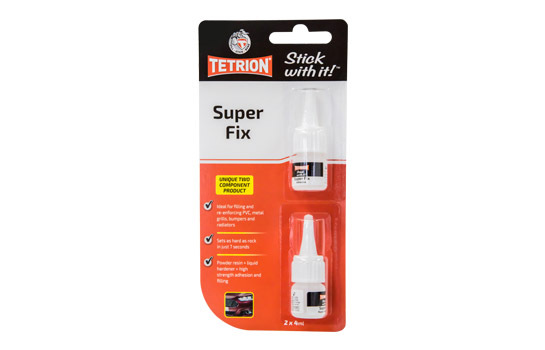 Perfect for repairs around the house and car; Tetrion Super Fix can be used to repair most plastics, PVC, surfaces, tools, toys, bumpers, Grilles, Radiators and much, much more. Once fully cured Tetrion super fix is suitable for sanding, drilling and painting meaning high strength, inconspicuous repair is easily achievable. My decorator recommended it for filling cracks etc before he painted exterior of house. It has done the job well and given a strong hard surface to work on. My husband asked me to purchase this product as he has used it before. It is great for filling in plaster cracks and knocks and, when it is dry and sand papered down, it is so smooth. Some plaster fillers on the market are virtually impossible to blend in without leaving mark, but Tetrion is really good. Once the wall has been painted, it is impossible to see where it has been used. Good product and competitively priced. Did an excellent job. Better than other related products by far. And delivery was first class.